Electronics make the world go around, and in the MOTUL FIM Superbike World Championship it is no different. 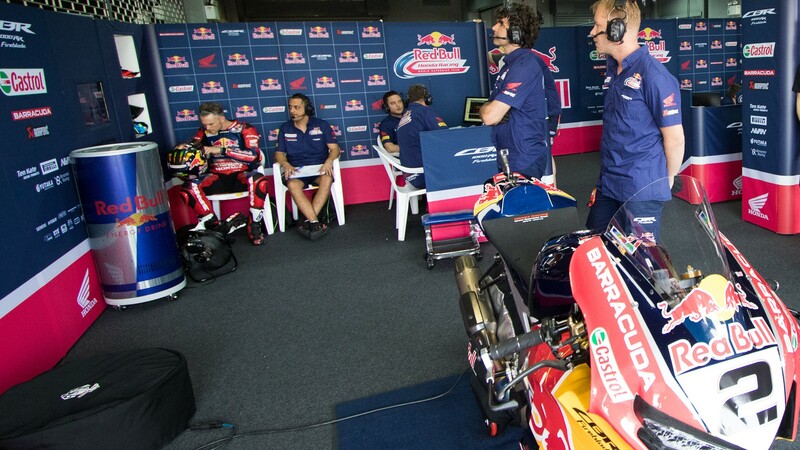 The key to cracking the code to a fast lap time comes from the ones and zeros in the Electronic Control Unit, and the Red Bull Honda World Superbike Team will make the switch from the Cosworth to Magnetti Marelli electronics system this weekend. This switch has been mooted throughout winter testing, as the TripleM Honda World Superbike squad with lone rider PJ Jacobsen started the campaign on the Magnetti Marelli unit, after despite strong performances from Leon Camier and Jake Gagne in the opening rounds, there was some doubt as to when the change would take place. For Round 3 of the WorldSBK season the change was made, and now the fortunes of the team will centre on making the adaptation as smooth as possible. While it is never ideal to undertake such a significant change during the season, the potential of the package is something that excites Leon Camier. The 31 year old has experience with the Italian software, and that could play a key role in accelerating the development for Red Bull Honda World Superbike Team. “It's working well but we know we need to find a bit more speed,” said Leon Camier. “The engine braking, the traction control, the anti-wheelie are good and now it's about getting it all refined. With a wet session and a problem in FP2 and then not a lot of running in FP3 it was a strange day but it was positive. I think that the step that we're making is very big, and one that's easy to underestimate, so to be so good so quickly really is a surprise. On the opening day at Aragon Leon Camier was able to test the bike in both wet and dry conditions and after completing 27 laps of the Spanish circuit he ended the day tenth fastest. Having gained automatic entry into Superpole 2 the Englishman was in a positive frame about their potential. Follow his progress with the electronics update, all with the WorldSBK VideoPass as riders take on day one and two around MotorLand Aragon.